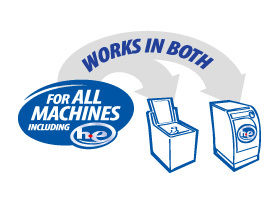 No matter what type of washing machine you use, you now have a lot more choices. That's because we've reformulated all Mas detergents to be Dual Compatible, meaning they work equally well in High Efficiency (HE) washing machines and standard washing machines. Just look for the Mas bottles with the new "For All Machines" logo on the front label! Why should I use Mas Dual Compatible formula detergents? HE washers tend to produce more suds than regular machines due to the back and forth tumbling action during wash cycles. Since they also use less water, suds are not as easily rinsed away. This can cause excess soils and foam to build up inside the machine, which may lead to odors, overflow, or machine malfunctions. Mas Dual Compatible formula detergents are specially formulated to generate less foam than regular detergents, which helps keep your washer functioning properly over time. The suds produced by regular detergents can also interfere with the washing action in HE machines by cushioning laundry as it tumbles. Mas Dual Compatible formula detergents are specially formulated to produce less foam, which helps ensure clothes move freely and any soils can be dislodged and rinsed away.